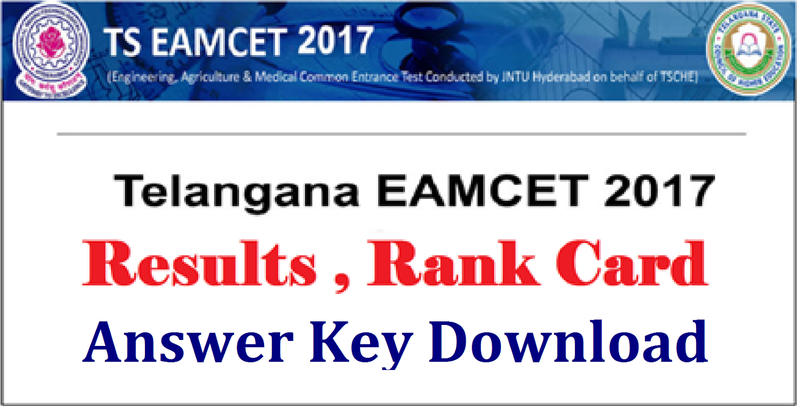 ts eamcetTelangana State Engineering, Agriculture & Medical Entrance Test (TS EAMCET 2017) is a state level entrance exam organized by the Jawaharlal Nehru Technological University, Hyderabad on behalf of Council of Higher Education (TSCHE). This entrance exam is conducted for providing admission into first year of various UG professional courses in the field of engineering, architecture, agriculture, etc. All universities and private colleges located in Telangana consider the score of this examination for offering the admissions in said courses. Here, candidates can get the details about TSEAMCET 2017 including application form, eligibility, exam dates, syllabus, etc. TS EAMCET Application Form 2017 will be provided from the 3rd March 2017. The last date for the submission of the application form without late fee will be 3rd April 2017. TS EAMCET Application Correction will be started from 7th April to 20th April 2017. Candidates should belong to the state of Telangana/ Andhra Pradesh. Candidates should satisfy local / non – local status requirements as laid down in the Telangana / Andhra Pradesh by regulations of Admission. Candidates with Diploma degree can also apply. The Application Form is available on the official website of TS EAMCET 2017- tseamcet.inin March 2017. The Application Process for TS EAMCET 2017 can be completed through online mode only. All the personal details, uploading of photograph & signature and payment of requisite fee needs to be done for getting registered. How to Apply for TS EAMCET 2017? The TS EAMCET Application Form 2017 can be filled via online mode only. The Registration link is available on the official website of TS EAMCET 2017. Candidates can simply follow the step wise guidelines to complete the TS EAMCET 2017 Registration Process. Visit the Official website of TS EAMCET. Fill details and Upload Photograph and Signature. Download and take printout of TS EAMCET Form. TS EAMCET Results 2017 will be declared via online mode. The TS EAMCET (Telangana State Engineering, Agriculture & Medical Entrance Test) is a state level examination conducted by Jawaharlal Nehru Technological University, Hyderabad. Through this exam, candidates will get admissions in different professional courses offered by various colleges in Telangana state. Here we are providing details about TS EAMCET 2017 Results. Candidates who have appeared in the TS EAMCET 2017 examination, may check the TS EAMCET 2017 Results via online mode through the website. After the result declaration, the TS EAMCET Rank Card 2017 will be released. Students can download their rank card by submitting details like Hall Ticket Number, Qualifying Exam Hall Ticket Number and Date of Birth. Students are advised to preserve the rank card for further process. The TS EAMCET examination will be conducted on 12th May 2017. The TS EAMCET Results 2017 will be provided to students 0n 22nd May 2017. After the result announcement, candidates will be able to download their rank card. The TS EAMCET Counselling 2017 will be organized in the month of June 2017. Candidates shall participate in the counselling process as per their rank in the TS EAMCET exam. Visit the official website of TS EAMCET 2017 (link will be provided here). 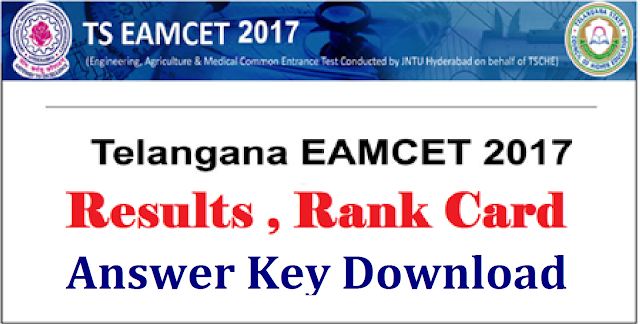 Click on the link related to “TS EAMCET Results 2017”. Candidates are required to enter their Hall Ticket Number. Print and download the result. Students are advised to take extra printouts of the result and keep it safe for further admission process.